When exploring the possibility of One Planet Development, we recommend participating in a One Planet Council meeting and/or looking through posts on the One Planet Council Facebook page. A quick search on that page will reveal a range of topics already discussed. Please do this before posting. This will save you time and effort down the line. In addition we recommend familiarising yourself with the official Practice Guidance and reading the following user friendly guide: Download our Advice on crafting a management plan for a One Planet Development planning application [PDF File size: 6.8MB]. 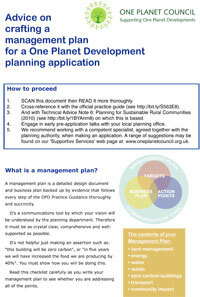 A management plan for your site is an essential part of a planning application for a One Planet Development in Wales. It is a detailed design document and business plan backed up by evidence that follows every step of the OPD Practice Guidance thoroughly and succinctly. It’s a communications tool by which your vision will be understood by the planning department. This guide is intended to help you produce a plan that is as crystal clear, comprehensive and well-supported as possible.